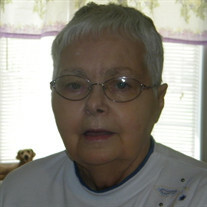 Muriel B. Hefley, 78, of Saint Elmo, Illinois, formerly of Vandalia, Illinois, passed away Monday, October 1, 2018, in Aperion Care, St. Elmo, IL. Graveside Services will be held at 10:00 A.M., Thursday, October 4, 2018, at Griffith Cemetery, RFD Brownstown, with Pastor Thomas Farris, officiating. Friends & Family will gather at 9:30 A.M., Thursday at the Cemetery. Memorials: First Church of God, Vandalia, IL. She was born, June 18, 1940, in Chicago, IL, the daughter of Walter & Bernice (Gangler) Harding. Married John L. Hefley, April 12, 1957, Hillsboro, IL. She was at Material Control Handler at Crane Packing, Vandalia, IL; Member of First Church of God; and former Fayette Co. Hospital Aux. Pink Lady, all of Vandalia, IL. She is survived by: Son - Raymond A. Hefley, Vandalia, IL; Grandchildren - James Jr., & John Thompson and Brandi Rhodes & Clayton, all of Vandalia, IL; Great Grandchildren - Sophia, Darren, Sherrie, Paul, James III, Katarina, John, Betty, Joel and Delaney. Preceded in death by: Parents; Daughter - Sherrie Thompson; Son - John Hefley, Jr.; Grandson - Joey Thompson; and Brothers - John & Jim Harding.